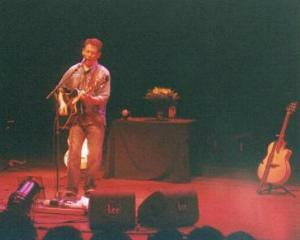 "My Family", Luka Bloom calls the three acoustic guitars that accompany him on his tour. The white one is called Judy, the black one Rudy, and the Spanish guitar is suitably called Carmen. With his Irish roots and gnarly countryside romanticism Bloom fits the classical image of a folksinger. On the other hand he is a one man band who takes full advantage of electric amplification, and who knew how to win a rock audience at Pinkpop for a repertoire which is not as traditional as it may seem. One of his finds is the way in which he turned L.L. Cool J's rap hit "I Need Love" into a kind of talking blues which even the biggest folk purist could not object to. 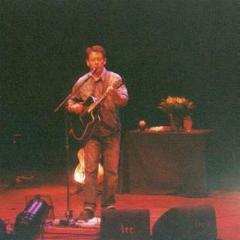 Luka Bloom is an excellent songwriter, who, on his recent album Keeper Of The Flame only performs other peoples' songs. "I got sick listening to my own moaning about broken hearts", he last night explained his setlist, which consisted of other peoples' songs for about 50 percent. Some were closely associated with his own tough man romanticism, like Bob Dylan's "Make You Feel My Love" and Tim Hardin's "If I Were A Carpenter". Others were less obvious, like the daring "Natural Mystic" by Bob Marley. In a wispy and subtly sung "No Surprises" (Radiohead) Bloom as a one man cover band equalled the emotion of the original. 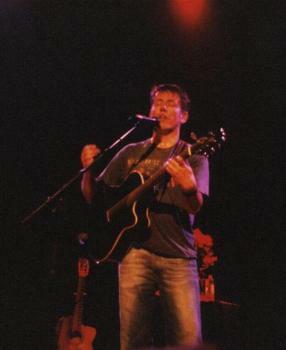 The two most noticeable tracks included on the CD, U2's "Bad" and Abba's "Dancing Queen" were not performed in Leiden. Instead he sang the comforting "Don't Be So Hard on Yourself" and the courtly ballad "Black is the Colour", a century old traditional, which makes for a great contrast with his rhythmic L.L. Cool J. rap. 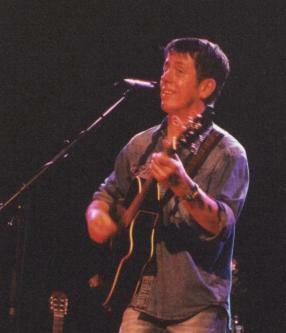 "It is ridiculous to get paid all this money for having this much fun", Bloom put his performance into perspective, a performance which did not need theatrical light effects in order to keep the audience's attention for an hour and a half. 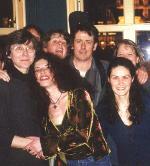 Singers/songwriters prosper well at De Kleine Komedie. John Hiatt wanted to take the theatre with him so he could play in it "all around the world". 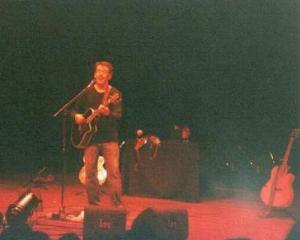 And Luka Bloom, who has seen more doorsteps, decided to delay the recording of his new live-album, till there were days available at De Kleine Komedie. Who was there during one of his shows in 1999, understands. An unequalled enthusiast public drove an unequalled enthusiast singer to the tops of his capacties and the encores were longer than the proper concert. This is susceptible to repeat and in an ambience like that you would like to record a CD. 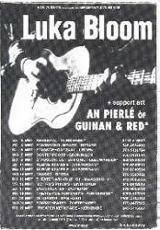 Bloom is a completely honest folksinger and an executioner on the acoustic guitar, who after a successful intermezzo in the States returned to his Irish roots. In one way or an other his story songs sound better in the old world. And in De Kleine Komedie on their best of all. 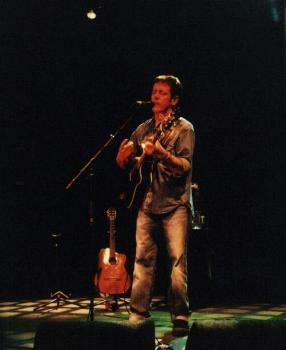 Luka Bloom will perform live. The rich guitar and lively lyrics that distinguish this Irish musician, singer and songwriter can be heard on 20 March at the Diligentia. 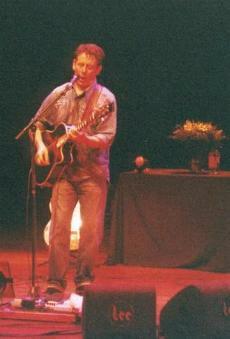 Luka Bloom concerts are typically filled with romantic and often joyful songs. 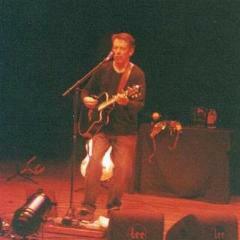 His most renowned albums are Riverside (produced in New York) and The Acoustic Motorbike (produced in Dublin). Songs like the LL Cool J cover "I need Love" and hits such as "An Irishman in Chinatown" and "Delirious" will no doubt be heard at the performance. reviews, setlists, photos & tour poster!